about the state of Extended? Fair enough. Extended has always been one of my favorite formats so I've got plenty more to say. I'll start this article by clarifying a few points that came up after last week's article and then I want to look at the history of Extended, with special emphasis on how we got into the current situation. "The Sky is Falling . . ."
The first point I want to clarify is the DCI's stand on "emergency bannings." (The DCI normally announces any changes to the Banned & Restricted Lists for all formats on March 1, June 1, September 1, and December 1 of each year, and those changes take effect one month later. An "emergency banning" is an announcement that doesn't follow this quarterly schedule.) I constantly see calls for emergency bans all over the 'Net. I also hear them from Pro Tour players at almost every Constructed event I attend. I even get phone calls from Pro Tour players before most major events in which those pros attempt to do their best Chicken Little impersonations. I think it's a real strength of the game that everyone cares so much. (Or maybe I just enjoy imagining Zvi Mowshowitz running around screaming, "The sky is falling!" (Wait a minute, I probably shouldn't say that out loud.)) However, there has only been one emergency banning in the long history of the DCI. Just one. And I don't think there will be another one unless some very special circumstances repeat themselves. The one card that was ever subject to an emergency ban was Memory Jar, which has the unfortunate text "draw seven cards" on it. However, the power of Memory Jar itself isn't why the DCI broke with its normal policy of quarterly changes. The only reason the DCI chose not to wait until the next regularly scheduled dates was because the very health of the Magic game was being threatened by "Combo Winter." Urza's Saga was four months old when Memory Jar came out in Urza's Legacy. During those four months, there was a large and loud public outcry about the way the game was being ruined by all the "broken" cards in Saga. Since Saga was affecting all Constructed formats, not just Extended, there wasn't anywhere for Magic players who didn't like combos to go. They either played against a steady stream of combo decks, or they didn't play at all. The DCI's first round of bannings in December 1998 didn't fix things and players began leaving the game in droves. It was vitally important to the health of the game to clean things up before too many more players walked away, so quite a large number of cards were included in the DCI's March 1, 1999 announcement, which would become effective April 1 of that year. Players were optimistic that Combo Winter was finally going to end. If you compare this situation to the current situation in Extended, you can see that there are two crucial differences: 1) The problem spanned all Constructed formats, 2) There was a huge buildup of angst about the format before the emergency ban candidate was even printed. I do not expect the DCI to issue any emergency bannings in the future unless both of these conditions are true -- there would have to be a preexisting problem (that included both public outcry and previous bannings) and the problem would need to span all formats and audiences. Furthermore, there was a real changing of the guard inside R&D as a reaction to the problems of the Urza block. If those of us who left the Pro Tour to join Wizards over the last four years do our jobs correctly, these conditions will never come up again. I fully expect us to have to ban cards again in the future (read my "Banning: Good or Bad?" article from February for an argument about why this is actually a good thing). However, when a mistake does happen, that doesn't mean an emergency ban is called for -- I actually think it's okay if a Pro Tour is dominated by a ban-worthy card. In fact, our general policy is to use the pros as guinea pigs – we let them try to break a format and then if they succeed we can fix it before the next qualifier season. Note that we care more about qualifier seasons that the Pro Tours because so many more people play in them (plus breaking a Constructed format is a pretty skillful thing to do, so rewarding the pros who do it most successfully seems reasonable). I know emergency bans are fun to speculate about and call for, but we haven't seriously considered one in years and we don't expect to have to ever again. The second point I wanted to clarify from last week is a pretty simple one – my sidebar forgot to mention that Sixth Edition will also leave Extended at the time of the next format rotation in October 2005 (along with the Tempest, Urza, and Masques blocks). Now then, here's my take on how we got to the place we're currently in, year by year. 1997: Extended is introduced and the world is a wonderful place (I might be biased here). Randy Buehler wins the first Extended Pro Tour with a Necropotence deck. 1998: Urza's Saga dominates Pro Tour–Rome. Tommi Hovi wins the Pro Tour with an artifact-heavy Tolarian Academy combo deck. Several rounds of bannings follow. 1999: Bob Maher Jr. wins Pro Tour–Chicago with a control deck based around Oath of Druids, though many people believed the English had the best deck. The English innovation is to use Necropotence to fuel a combo deck. The ensuing PTQ season sees "Trix" rise to power as the "Fruity Pebbles" combo of Goblin Bombardment/Enduring Renewal/0-mana creature is replaced by the much more efficient Illusions of Grandeur/Donate combo. 2000: There is no Extended Pro Tour, but Trix continues to be the deck to beat in qualifier tournaments. Necropotence is finally banned. 2001: Kai Budde wins Pro Tour–New Orleans with yet another version of Trix, but Alan Comer's "Miracle Gro" deck takes over the qualifier season. Pretty much every playable deck includes four copies of Force of Will. 2002: Here's where the story gets more relevant to what's going on today, because the fall of 2002 was the last time the Extended format rotated. The Ice Age (Ice Age-Alliances-Homelands) and Mirage (Mirage-Visions-Weatherlight) blocks left the format, along with the ten dual lands and the Fifth Edition core set. This rotation shook things up dramatically. The departure of Force of Will means players might be able to rely on having their spells actually resolve, the Illusions/Donate combo is eliminated (since Illusions was in Ice Age), and the Oath decks lose Gaea's Blessing. Going into Pro Tour–Houston, I don't think anyone knew exactly what to expect. The story also gets easier to tell at this point because I can point you to articles I wrote at the time. I wrote "On the Brink of Banning" after I returned to the office from Pro Tour–Houston. The quick summary is that everyone thought PT–Houston would be terrible, but it was actually quite fine. The format was not yet solved and people actually thought it looked pretty good. Justin Gary won the Pro Tour with an Oath of Druids deck, defeating teammate Rob Dougherty's "Reanimator" in the finals. R&D was nervous because games seemed to be decided so quickly, but the QT season was popular and diverse, with Grand Prixs being won by "Enchantress," "Turboland," and "Sligh." May 2003: The last Masters Series tournament is held in Yokohama and Bob Maher, Jr. wins it with a Tinker deck. The field has quite a reasonable diversity of decks, though all of them are designed to do fairly ridiculous things, fairly quickly. August 2003: It took a year, but the pros finally managed to break the new Extended format. Day 3 of the World Championships uses Extended and the games are blisteringly fast, with everyone involved complaining that the format is terrible. The Japanese unleash their "Gobvantage" deck on the world, abusing Goblin Recruiter along with the powerful Goblins from Scourge. Mind's Desire turns out to be no better than the other combo decks that were already around, but it's not exactly an endorsement of a format when people are defending it by saying "it's just one more turn-3 kill deck." The DCI is in a tough place because the pros have broken the format in half, but the general public hasn't really noticed yet. On paper, the format actually looks reasonable because there are quite a number of different strategies you could use to win on the third turn, but the games aren't played out on paper and in practice there is really only one strategy: Win by turn 3 or mulligan until you can. 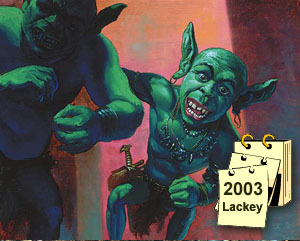 September 2003: Three cards are banned from Extended: Goblin Lackey, Entomb, and Frantic Search. The goal of these bannings is to take away some of the speed from Extended and to shake things up so Pro Tour–New Orleans will be interesting. All the Tier 1 Extended decks from Worlds used one of these three cards, and no one wants to overreact (especially since the QT-level players still seem fond of the format) so the DCI stops at three cards. 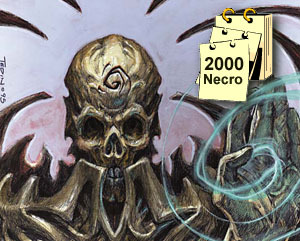 November 2003: Pro Tour–New Orleans is thoroughly dominated by fast combo decks. The introduction of Chrome Mox seems to speed things up by even more than the bannings had slowed things down. The Mirrodin set also introduces Goblin Charbelcher, which provided a 2-card combo kill with either Mana Severance or Goblin Recruiter, and several other artifacts that adds power to old-school Tinker designs. The Tinker decks rise to the top of the Swiss, and the finals see Rickard Österburg's "Tinker-Stax" defeat Gabriel Nassif's "Tinker-Belcher." Tinker decks may dominate the Top 8, but they are by no means the only abusive decks running around. The three months since Worlds gave the pros lots of time and opportunity to fine-tune their decks. "Angry Hermit" decks shrugged off the loss of Entomb and actually gets a lot easier to play since it's now forced to rely on Hermit Druid instead of having a backup plan. Goblin decks decide that attacking an opponent for less than 20 damage was only good enough to serve as a backup plan and they all build in combo-kills (either Food Chain/Goblin Recruiter/Goblin Ringleader with Goblin Warchief eventually giving everyone haste or Goblin Recruiter/Goblin Charbelcher). Ancient Tomb is the most played card (other than basic land) at the event, which makes sense since speed is crucial but no one ever attacks for less than 20 damage. Clearly the three bannings after Worlds are not enough to fix the format. To be fair to R&D and the DCI, however, no one thought we were trying to "fix" the format. As I explained earlier, the intent was just to try to take some of the sting out of things for the pros while letting everyone else continue to have fun playing with all their cards. By January 1, 2004, though, we know public sentiment will be different and this time around R&D's recommendation to the DCI will actually include enough cards to plausibly fix things. Currently, the best decks in the format can kill a goldfish on turn 2 when they get a good draw, and they can kill on turn 3 fairly consistently. It's not possible to eliminate all the decks that can sometimes kill by turn 3, but the format would be a lot more fun and a lot more fair if turn-3 kills require a good draw and turn 4 is the norm (for the Combo decks, anyway). That should open up both beatdown and control as viable strategies, and hopefully the format will start to resemble "normal" Magic again. So there you go, that's my view on where we've been, where we are now, how we got here, and where we should go in the future. I know a lot of you have been clamoring for more insight into why the DCI bans the particular cards that it does choose to ban so I will revisit this issue in my first column after the next B&R announcement.